You see, these are the participants in our Andando micro loan program, and they've had a few months now to utilize these small loans for the purpose of making a living. 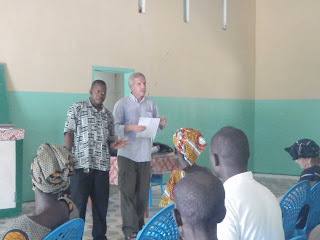 My goal was to help them improve their business by teaching a fews key business points. It went well, except it was really hot inside this building, I mean like 100 degrees. It was a concrete building with a tin roof in the middle of the African bush, no air conditioning or power or water. It was also very humid, but they didn't seem to mind (I did!). But I was delighted to hear their success stories and most of them are doing pretty well already. In fact they have paid back most of the micro loans already and we can now expand the program. It was a long day, and after an "African" lunch, where everyone sits on the ground and eats out of a communal bowl, we visited some farms nearby where some of the loan recipients work their land. Older PostNow is the time to buy!